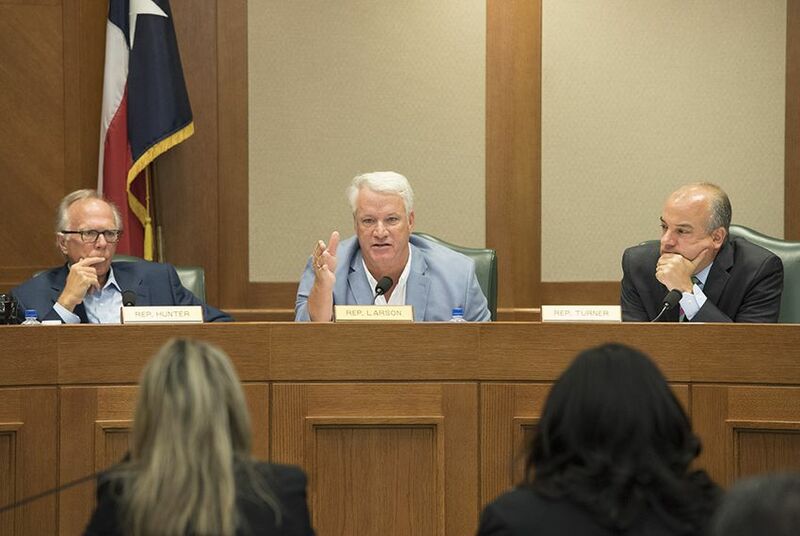 "I want to know exactly ... if there [were] any violations of the law or violations of the process, and I think that's incumbent upon everybody on this committee to figure out if that transpired," said Rep. Lyle Larson, R-San Antonio. "If the law wasn't broken, then I want to know exactly how we can correct it." "There's going to be absolute certain change to this statute, but let's work together to get it right," said Committee Chairman Rep. John Kuempel, R-Seguin, during the hearing. In June, House Speaker Joe Straus, R-San Antonio, asked the Legislature to examine the issue. He had previously called for limiting the practice in order to ensure "that agencies use taxpayer dollars appropriately." Larson called on the state auditor's office to provide information to the panel from their ongoing review of state agencies' use of emergency leave, specifically for the agencies that have "gained all the notoriety because of this." State officials at the hearing revealed that the list of state agencies currently implicated in potentially misusing emergency leave and departure agreements includes the Attorney General's Office, the General Land Office, the Agricultural Commission, the Water Development Board, the Teachers Retirement System, the Department of Family and Protective Services and the Parks and Wildlife Department. In June, Texas Gov. Greg Abbott and Comptroller Glenn Hegar ordered state agencies to stop placing their departing employees on emergency leave as a way of keeping former employees on the state's payroll past their last day of work. While representatives from the Attorney General's office and the General Land Office said they would follow the directive, Phillip Ashley, associate deputy comptroller of fiscal matters, told the panel he couldn't say definitively that emergency leave had not been granted inappropriately to an employee since the new directive was issued. "There are three constitutional offices headed by elected officials who are under no obligation, as I understand it, to do what the governor or the comptroller tell them to do," said state Rep. Chris Turner, D-Grand Prairie, following the hearing. "And that's where it comes back to — people have to follow the law. And that should include the spirit of the law." Turner said while Tuesday's hearing shed light on several inquiries the panel had, numerous unanswered questions remain. "I think we have to hear directly from the agencies who engaged in this practice," Turner said after the hearing. "We need to hear their side of the story, hear why they think that was permissible under the law and under the constitution, so I hope that's the next step. I hope we'll be hearing from them soon." State Rep. Joe Moody, D-El Paso, seemed to hint at a future subpoena of agency officials during the hearing, as he asked representatives from the Texas Legislative Council to outline "special powers" the committee has as an investigative unit. "This committee does have the power to issue subpoenas," Turner said. "I think if the agencies are not forthcoming with the answers to our questions, then we need to have that option readily available to us." Tuesday's hearing came two months after the Senate Finance Committee expressed an interest in revising the policy, with several members vowing to "tighten it up" during next year's legislative session.